A 97-year-old woman who stood first in the Kerala literary mission’s ‘Aksharalaksham’ exam has been honoured by the Commonwealth of Learning organisation based in Vancouver, Canada. Karthyayani Amma of Muttam has been named Commonwealth learning goodwill ambassador, dedicated to the promotion of distant education in Commonwealth countries. Commonwealth of Learning’s goodwill president Balasubramaniam had visited Karthyayani Amma earlier and handed over an award. She is preparing for the Class 4 exam and is confident of winning the Class 7 and 10 equivalent exams. The Commonwealth of Learning Goodwill Ambassador includes 53 countries. Amma’s story of perseverance and dedication to learning, even at an age of 96, would be published in various publications across countries, reported Matrubhumi. The photographs of Karthyayani Amma writing Aksharalaksham examination at Harippad in Kerala’s Alappuzha district had gone viral a couple of months ago. 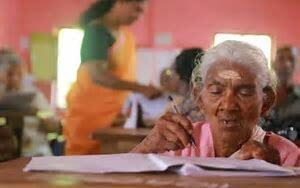 Keralites lauded her perseverance and hard work despite the old age. She had set a new record by scoring a stellar 98 out of 100 and was the oldest among 42,933 candidates who cleared the literacy examinations last year. She was gifted a laptop recently by Kerala Education Minister C. Raveendranath. Amma lives in Muttom village near Cheppad in Alappuzha district. She worked as domestic help and a cleaning staff in temples and nearby households and had never been to school. In January 2018, a literacy crew of Cheppad grama panchayat along with its secretary went to Laksham Veedu Colony, a government housing for the elderly. While most women housed at Laksham Veedu Colony shied away to avoid the literacy drive, Karthyayani Amma was the one who came forward in a bid to enrol herself. Reportedly, her zeal to pursue education started a couple of years before this when she saw her 60-year-old daughter, Ammini Amma pass the literacy mission’s course, which is equivalent to the class 10 level in formal educational courses. She is now qualified to enter Class IV equivalency course. Her teacher Sati K. said “She is very enthusiastic about education and it was reflected in her marks. She is eager to continue education”. In a tweet she also said that she let others copy from her. ‘Aksharalaksham,’ a project by the Kerala State Literacy Mission Authority (KSLMA), aimed at eradicating illiteracy among aged and deprived population of Kerala, has attained 99.08 per cent success in 2018, as 42,933 out of 43,330 candidates cleared the test. Be the first to comment on "Kerala literacy exam’s 97-year-old topper Karthyayani Amma becomes Commonwealth’s goodwill ambassador"